I folded it along the 4 and the 8 so that the 0 is on top of the 8 and the 4 is on top of the 12. I then folded it along the 12 and the 16 so that now the 0 is on top of 8 which is on top of 16 and the 4 is on top of the 12 which is on top of the 20. I ended up with some stacks of numbers that are on top of each other. 1, 7, 9, 15 and 17 make a stack which has total of 49. The stack made of 0, 8 and 16 has a total of 24. The stack made of 3, 5, 11, 13 and 19 has a total of 51. We will be focusing on totals made in this way (like 49, 24 and 51 above). The challenges below involve varying the length of the number line. However, you must always start with 0 and each folded section must be the same length. There must always be at least one fold in the number line and folds must go through a number. Find three different ways to get a 'stack total' of 36 using lengths of 21 to 36 inclusive, showing exactly how you fold the number lines. 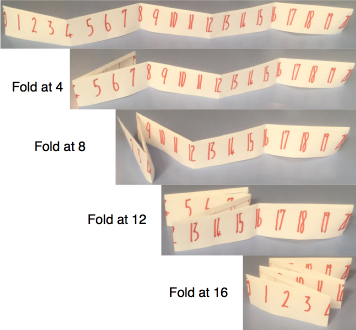 Find as many ways as you can to get a 'stack total' of 48 using lengths of 21 to 36 inclusive, again showing exactly how you fold the number lines. Now using lengths from 21 to 50 inclusive, find a length which contains all the 'stack totals' of 69, 70 and 71 when folded. This sheet contains a copy of the task. Investigations. Practical Activity. Working systematically. Addition & subtraction. Multiplication & division. Interactivities. Combinations. Questioning. Compound transformations. Visualising.